The end of the calendar year is only the mid-point of the new season and the concert calendar. Still, it is a good time to take stock of the past year and the various performers and performances that we heard. 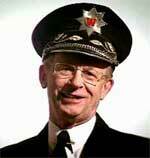 To be fair, The Ear doesn’t always agree with Barker on the quality of some pieces and of certain performances. But by and large the two of us are in accord, and even when we aren’t, the Ear respects and learns from Barker’s expertise and experience. 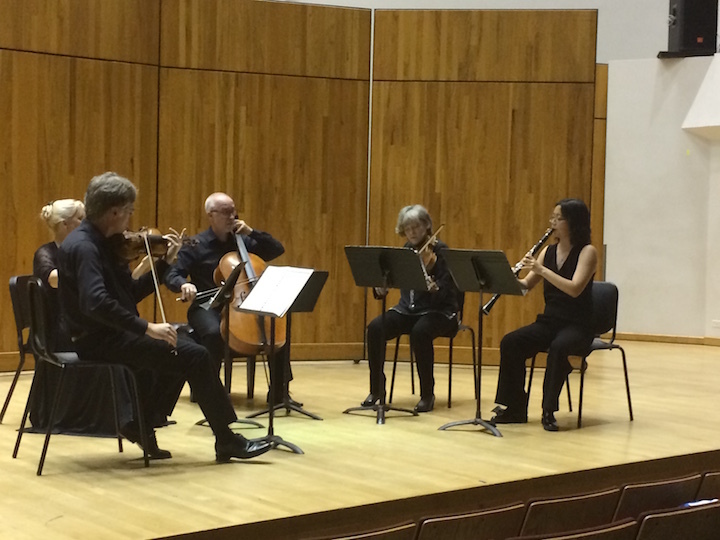 The all-Mozart concert in the fall by the Pro Arte Quartet (below) — with UW faculty clarinetist Alicia Lee and San Francisco cellist Jean-Michel Fonteneau filling in for Parry Karp, was a much-needed balm in these times of distress. 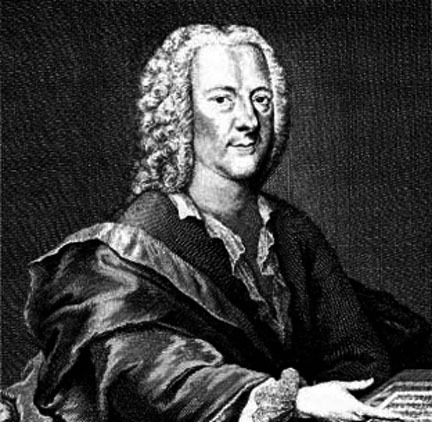 You heard all kinds of musicians, from students and adult amateurs to professionals, in all genres of music, including arrangements and transcriptions that Johann Sebastian would no doubt have approved of. 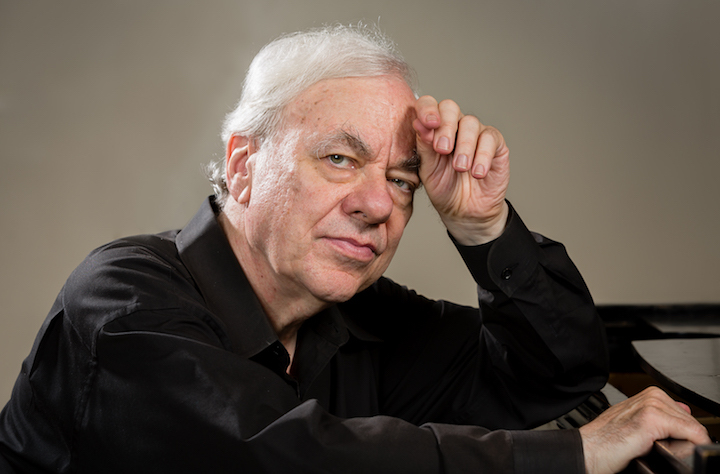 Pianist Richard Goode (below), who played this fall at the Wisconsin Union Theater, showed the power of softness and quiet. His subtle playing was full of nuance in preludes and fugues from The Well-Tempered Clavier, Book II, by Johann Sebastian Bach; in a late sonata by Ludwig van Beethoven; in the only sonata by Anton Webern; in a generous group for Chopin works; and in an unexpected encore by the English Renaissance composer William Byrd. All in all, Goode proved a wonderful reprieve from some of the heavier, louder and more dramatic keyboard playing we hear. 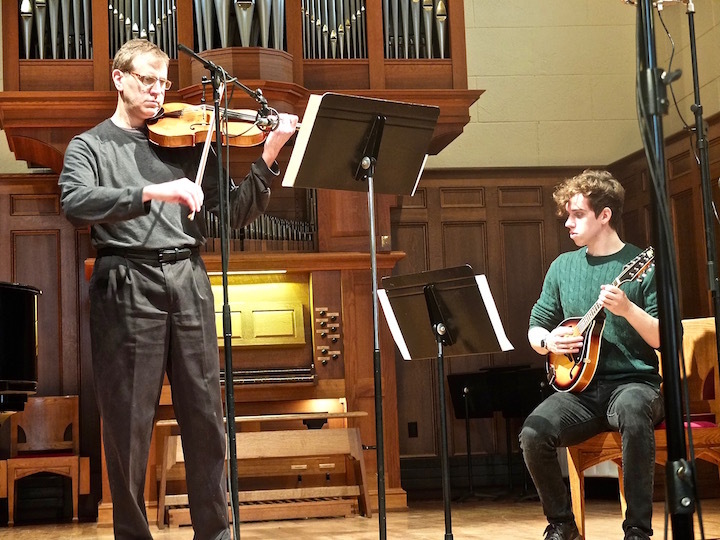 But if you wanted drama, you only had to attend the recital by UW-Madison virtuoso Christopher Taylor (below). He excelled in everything, especially the total-body playing of the solo piano arrangement by Franz Liszt of Beethoven’s Symphony No. 7, which wowed the house. But he also showed great restraint, tone and subtlety in contemporary American composer John Corigliano “Ostinato” based on that symphony’s famous second movement. Then Taylor finished up with contrasting sets of six Musical Moments by Franz Schubert and Sergei Rachmaninoff. BUT NOW IT IS YOUR TURN: YOU BE THE CRITIC! What did you think was the best concert and best single performance you heard in 2017? What was the most memorable classical music experience you had in 2017? And what was the most enjoyable classical music performance you heard in 2017? As always happens towards the end of a semester, the tempo of the performances at the UW-Madison’s Mead Witter School of Music picks up and accelerates. 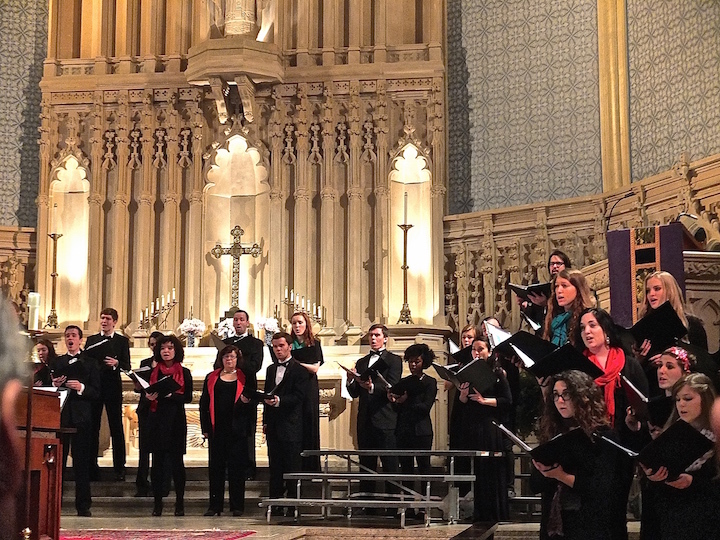 One highlight this week is two performances of a traditional choral concert. 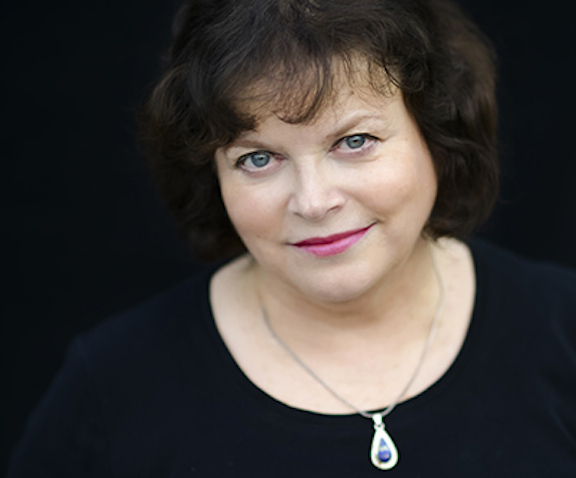 Under conductor and UW choral program director Beverly Taylor (below), six of seven UW-Madison choirs — Chorale, Concert Choir, Madrigal Singers, University Chorus, Women’s Chorus, Masters Singers – will perform their annual winter concert twice this Sunday afternoon. The two performances, at 2 and 4 p.m., will be at Luther Memorial Church, located at 1021 University Avenue. Consider arriving early since these concerts are often very well attended. Choirs will perform choral works as individual ensembles and jointly. 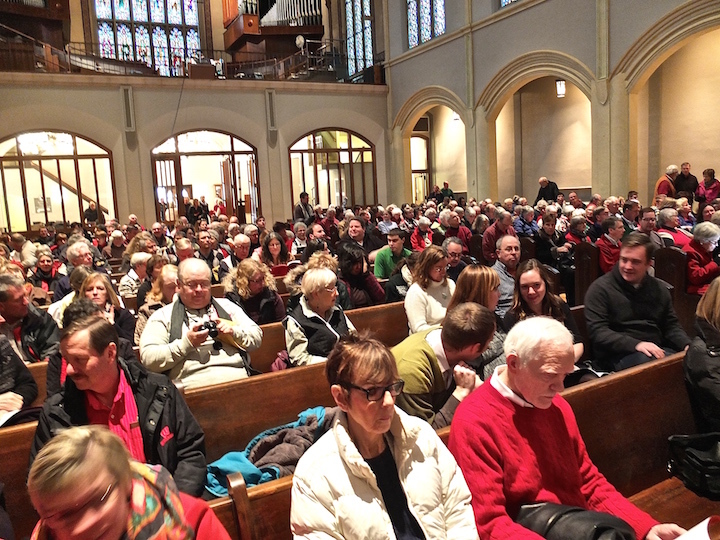 Holiday carols are part of the program and concert-goers are invited to sing along. Sorry, but no composers or titles of works have been provided. 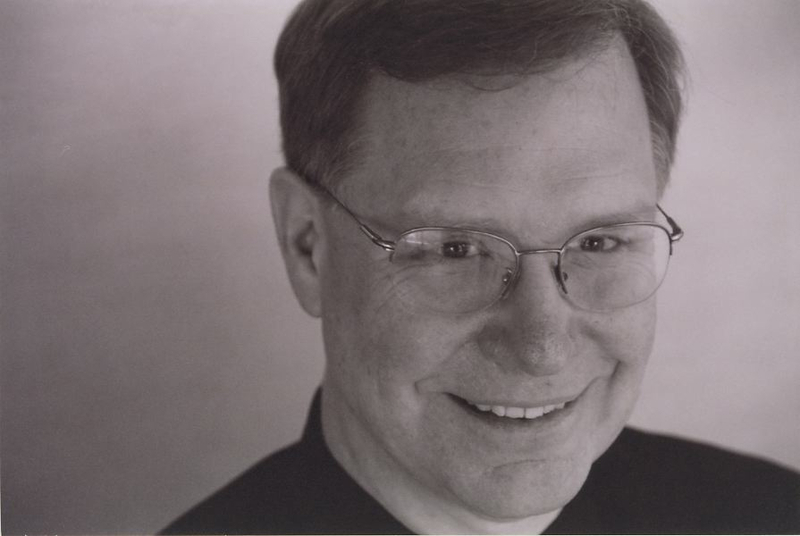 Professor John Chappell Stowe (below, in a photo by Katrin Talbot) will perform organ music for the season. A free-will offering is accepted at the end of the program with proceeds after expenses donated to “The Road Home,” an organization that provides housing and food to homeless families. At 7:30 p.m. in Mills Hall, UW bassoonist Marc Vallon (below top, in a photo by James Gill) will perform a FREE program called “Breaking New Ground” that features the music of Carl Philipp Emmanuel Bach, Anton Webern and Yannis Xenakis among others. 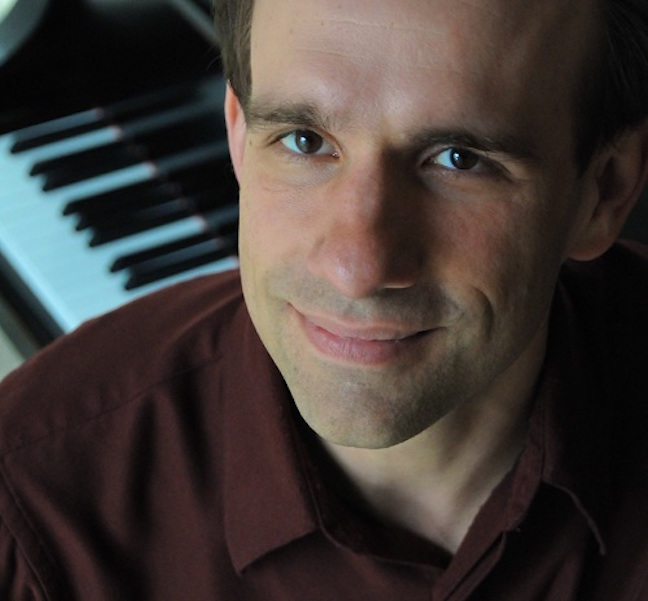 UW pianist Christopher Taylor (below bottom) will also play the last piano sonata, No. 32 in C minor, Op. 111, by Ludwig van Beethoven. At 4 p.m. in Mills Hall, the All-University Strings (below in a photo by Jeff Miller of the UW-Madison), which is made up of students from all fields and not just music, will perform a FREE concert under conductor Matt Chan. No word on composers or works on the program. At 12:30 p.m. in the Brittingham Gallery No. 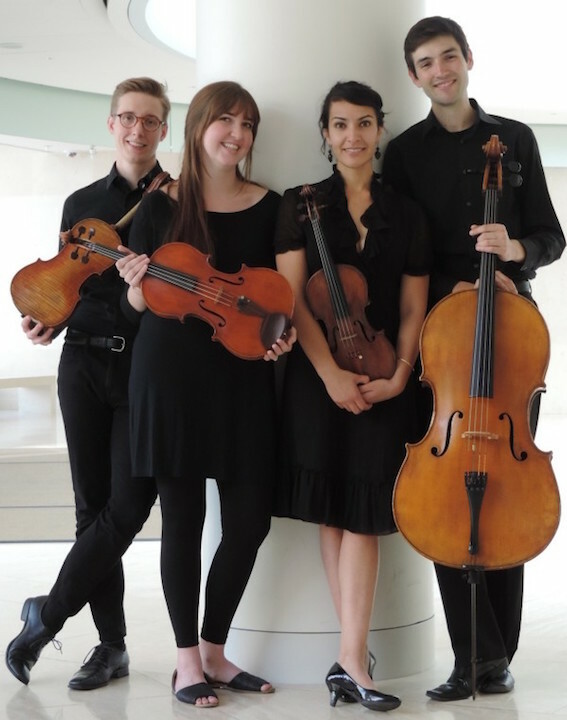 3 of the Chazen Museum of Art, the Wingra Wind Quartet will perform on “Sunday Live at the Chazen.” Admission is free. The program includes: “Piano Piece” by Richard Strauss and arranged by Marc Vall0n; Wind Quintet by Theodor Blumer; “Eight Etudes and a Fantasy for Woodwind Quartet” by Elliott Carter; “Opus Number Zoo” by Luciano Berio. 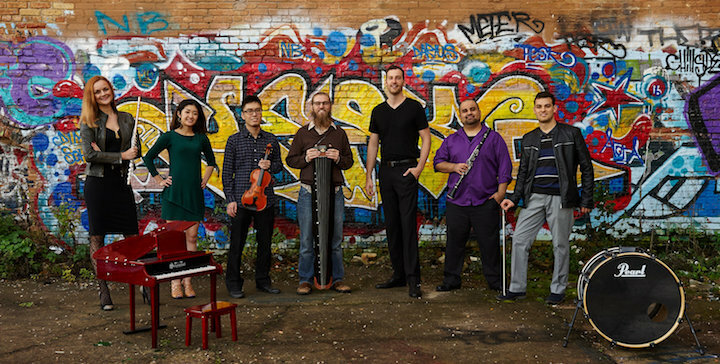 Members (below, from left, in a photo by Katrin Talbot) are: Marc Vallon, bassoon; Timothy Hagen, flute; Alicia Lee, clarinet; Aaron Hill, oboe; and Joanna Schulz, horn. 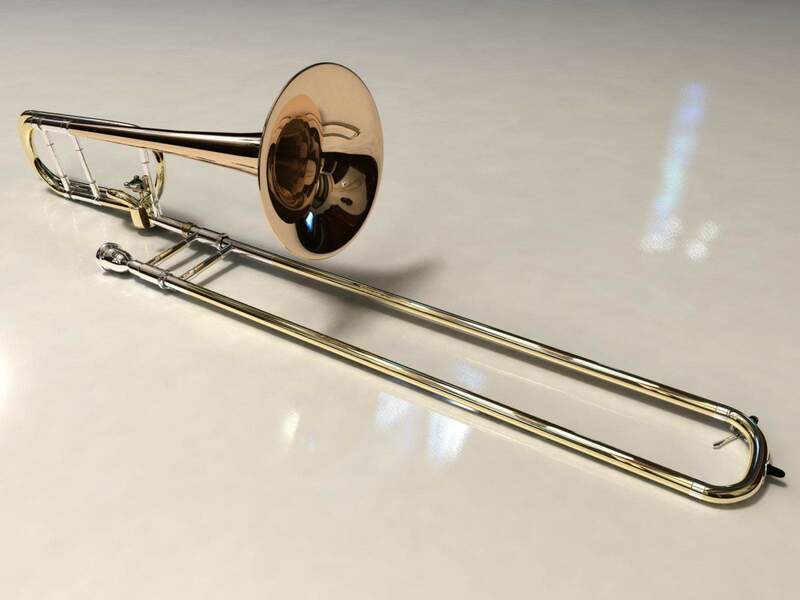 At 1 p.m in Mills Hall, the UW Concert Band (below top), under conductor Scott Teeple, will perform a FREE concert.The program features UW trombonist Mark Hetzler (below bottom). 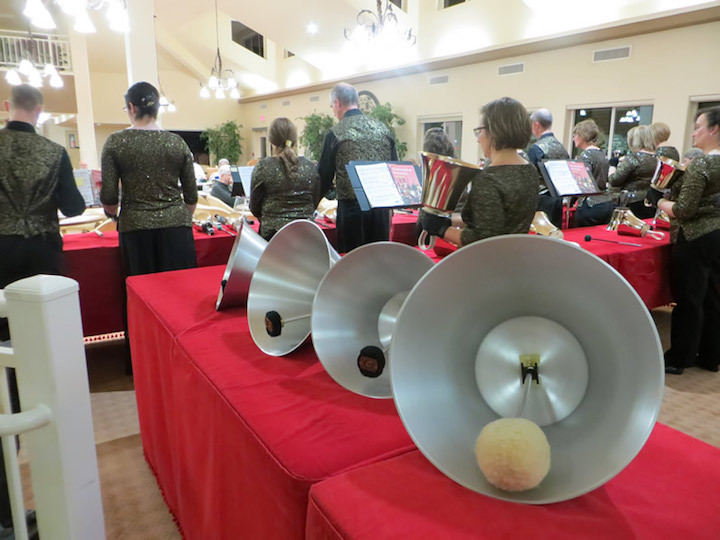 The program includes “Psalm for Band” by Vincent Persichetti (heard in the YouTube video at the bottom) “Silver Lining” by Anne McAninch, a UW doctoral student in composition; and “Falling” by Mark Hetzler. 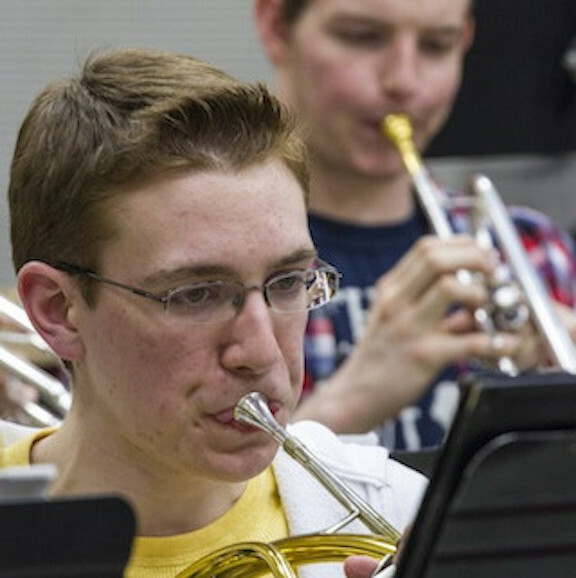 At 4 p.m. in Mills Hall, University Bands will perform a FREE concert. No word on the program. In retrospect, it seems inevitable. But it took foresight and hard work. For many years, the historic town of Mineral Point (below) – once a major lead and zinc mining town that is the third oldest city in Wisconsin – has been cultivating and rejuvenating itself through restoration and innovation as an enjoyable tourism stop, with fine restaurants, historic landmarks, terrific art galleries and gracious hosts. 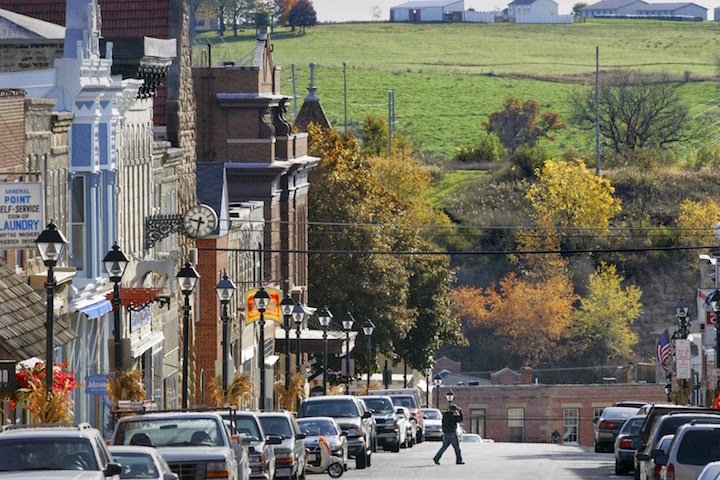 Small wonder that the Smithsonian Magazine named Mineral Point one of the Top 20 Small Towns to Visit in the U.S. But this coming weekend the appeal and attractions will move up a big notch. That is because the inaugural Mineral Point Chamber Music Festival will take place this coming weekend, June 9-11, 2017. To The Ear, the performers look excellent, the program look engaging and the prices sure look affordable. 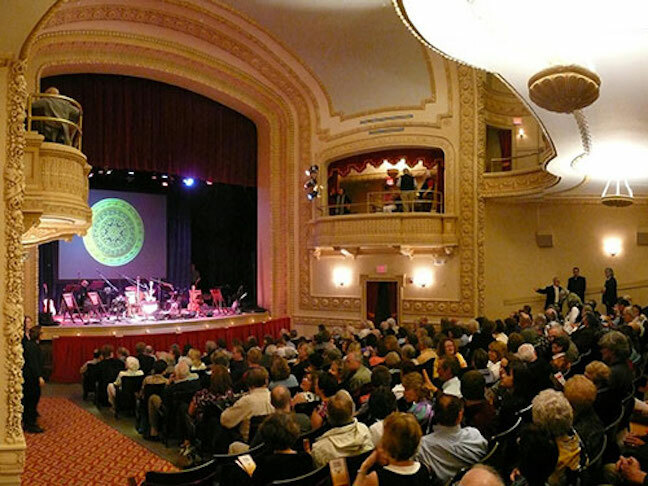 Concerts by three young professional classical chamber music ensembles will be presented in the recently restored historic Mineral Point Opera House (below top and bottom, with the top photo by Michael J. Smith), an ideal chamber music venue with excellent acoustics. 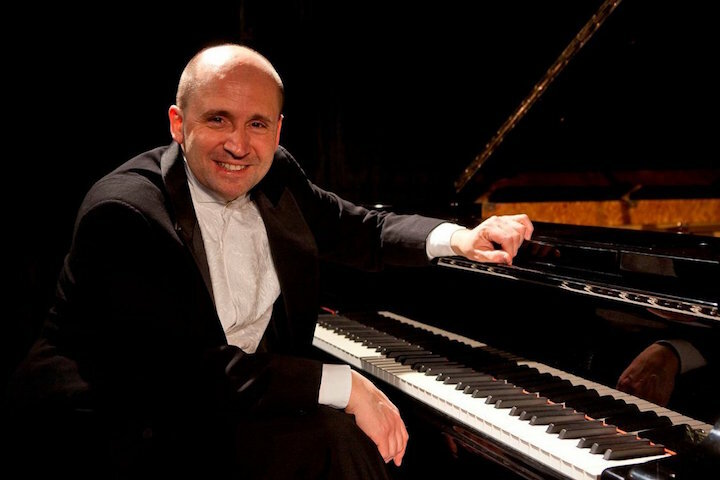 The weekend will begin on Friday at 7 p.m. with a panel discussion by several ensemble performers and Festival Director Peter Schmalz about various aspects of classical music. A reception in the Mineral Point Public Library will follow the discussion. Ticket prices are: $10 for the panel discussion and reception; $15 for each concert; and $38 for the panel discussion and all three concerts. 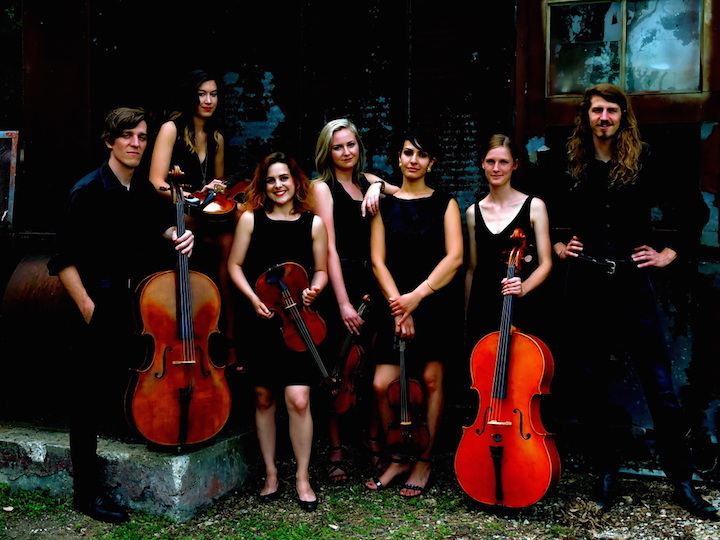 “The Mineral Point Chamber Music Festival is designed to meet three goals: to create classical chamber music listening opportunities for local and nearby residents; to establish a cultural tourism experience for visitors to Mineral Point; and to provide serious off-campus performances for advanced university chamber music ensembles. “Summer classical music festivals were established in the 20th century to provide employment for orchestral and other professional musicians during the off-season. The fortunate result for the music-lover is an abundance of listening opportunities in every genre of classical music, often in locations away from the congestion and heat of large cities. 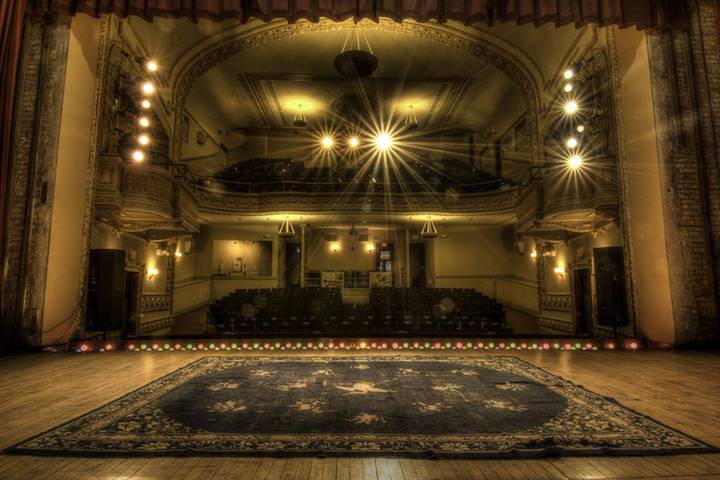 The Mineral Point Opera House is, in size and acoustics, an ideal venue for classical chamber music. Performers were selected by competitive audition, and will be housed by local residents for the weekend. 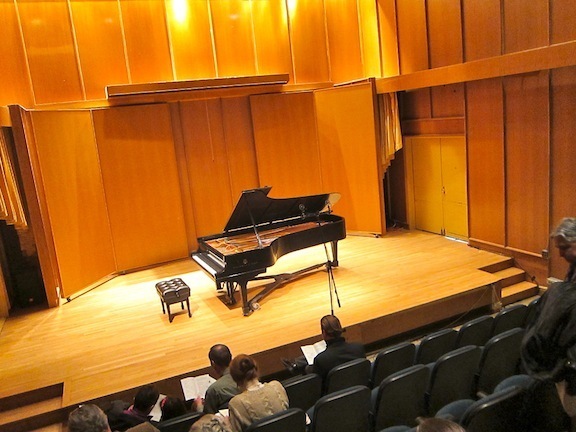 In addition to three concerts, festival attendees can be involved in a panel discussion about issues in classical chamber music, by asking their own questions of the panel. 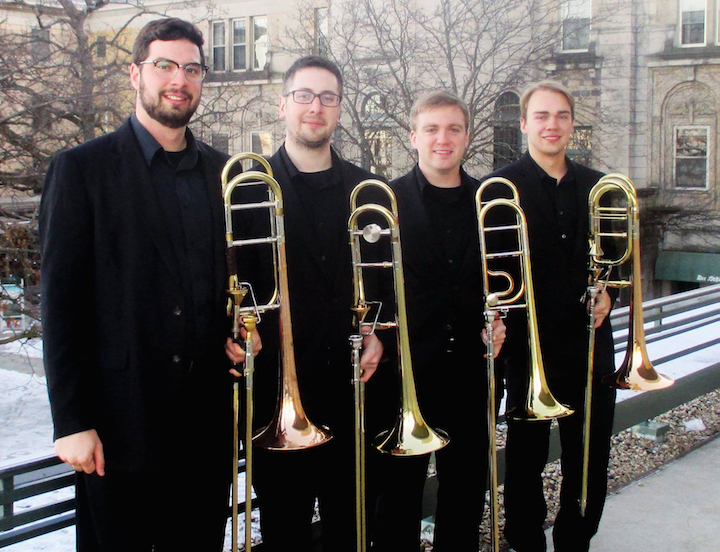 The UW-Madison Trombone Quartet and students from Mineral Point High School and Dodgeville High School will also present a short concert in Library Park prior to the 1 p.m. concert on Sunday in the Opera House. Classical music: Performers and presenters should list individual pieces as well as composers. Plus, a FREE concert of saxophone music is this Friday at noon. ALERT: This week’s FREE Friday Noon Musicale, to be held from 12:15 to 1 p.m. in the Frank Lloyd Wright-designed Meeting House of the First Unitarian Society of Madison, 900 University Bay Drive, features Peter and Joseph Ross playing original music for saxophone and piano. 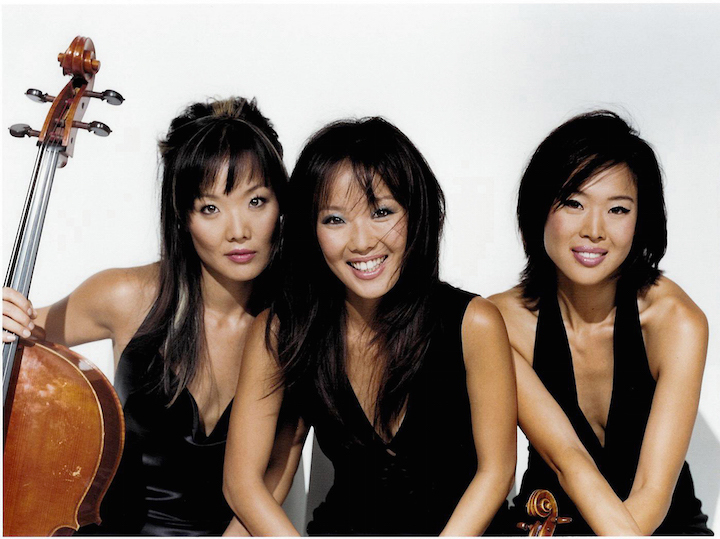 This Friday night at 8 p.m. in the Capitol Theater, the Ahn-Core-Ahn Piano Trio (below) returns to Madison to play …. Well, The Ear just doesn’t know what they will play. He can’t find a hint of a program anywhere on the Overture Center website. Just a link for blindly purchasing tickets for $30-$40. 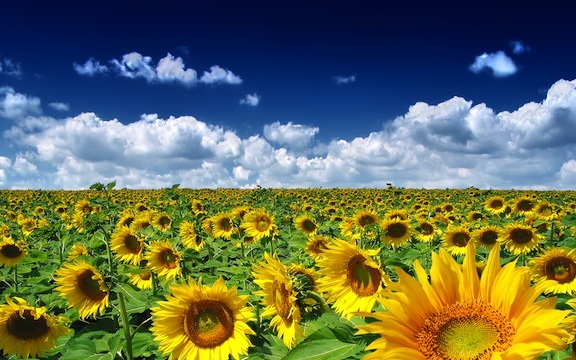 Is The Ear — who is more interested is helping to correct the situation than in scolding — missing something? That kind of omission has long been an annoyance for The Ear. It does a disservice to potential audiences and to the performers. His friend The Curmudgeon agrees. The Curmudgeon asks: How do you know whether to attend a concert or not when either no program is listed or some kind of generic program saying works by, say, Johann Sebastian Bach, Ludwig van Beethoven and Benjamin Britten? Why do press releases and concert listings so often refuse to list specific pieces? Do they think the name of an individual or group performer is enough to sell tickets? The Ahn Trio — with its cute proper-name pun Ahn-Core (“encore”) — is hardly alone. 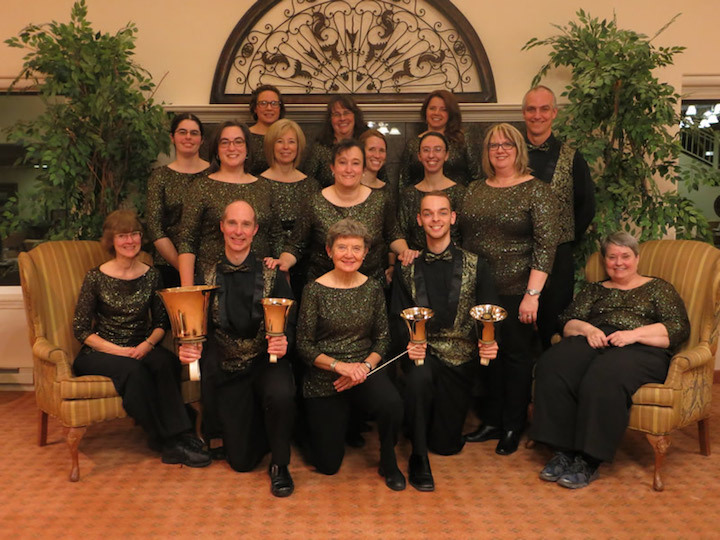 Same goes for the program for the Intergenerational Choir (below) of the Madison Youth Choirs and the Capitol Lakes Retirement Community for this coming Saturday night. All The Ear knows is that it features music by William Billings, Henry Purcell and Bob Dylan as well as some traditional Irish tunes. The Ear loves piano trios. 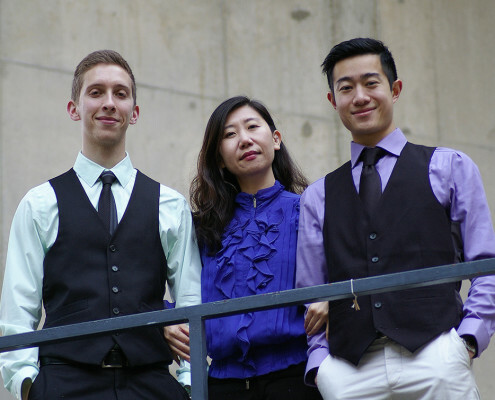 So when he looked at the University of Wisconsin-Madison School of Music to see what the Perlman Piano Trio (below) will play at its FREE concert on Saturday, April 9 at 3:30 p.m., nothing – not even composers — was listed. It is also true for this month and in coming weeks. The UW Symphony Strings, which performs a FREE concert on Thursday, March 17, at 7:30 p.m in Mills Hall, lists neither composers nor pieces on the website calendar for the UW-Madison School of Music. 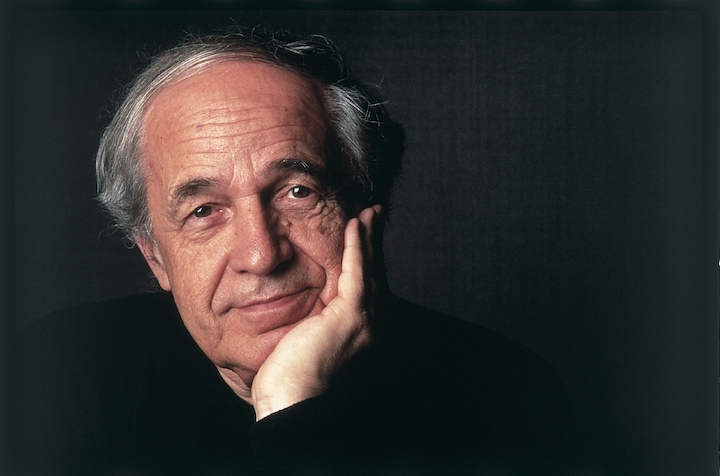 The same goes for the interesting FREE homage concert to the late French avant-garde composer and conductor Pierre Boulez (below), on Friday, March 18, at 8 p.m. in Morphy Recital Hall. 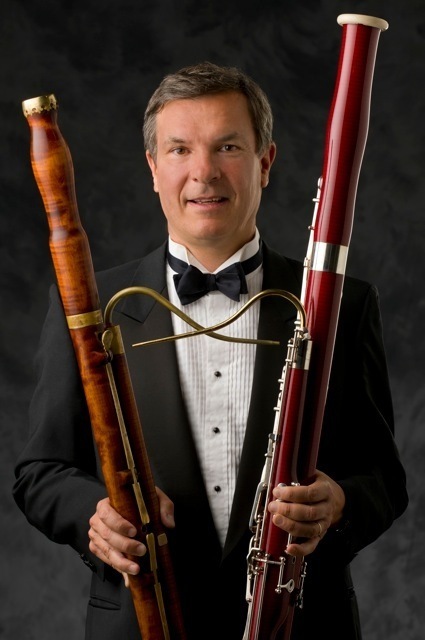 It has a great faculty lineup, including the gifted UW-Madison bassoonist Marc Vallon, who worked with Boulez. And what is the music? Works by Boulez, Anton Webern, Johann Sebastian Bach and Claude Debussy. Well, that certainly narrows it down. The examples I cite are not rare. It happens often and with many groups and individuals, and it looks very unprofessional and proves very unhelpful to potential audiences. You know, the same customers who are supposed to be always right. 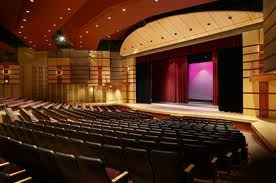 To be fair, many major performers and presenters – including the Madison Symphony Orchestra, the Madison Opera, the Wisconsin Chamber Orchestra, the Wisconsin Union Theater, the Bach Dancing and Dynamite Society, the Madison Early Music Festival, the Willy Street Chamber Players, the Ancora String Quartet, the First Unitarian Society of Madison, the Wisconsin Baroque Ensemble and the Token Creek Chamber Music Festival among others — generally do list specific works as well as composers. But when it comes to the ones who do not, it is all very frustrating. Do such omissions result from laziness or neglect? Or perhaps making wrong assumptions? Why would they refuse to share their specific program with publicists and the public? 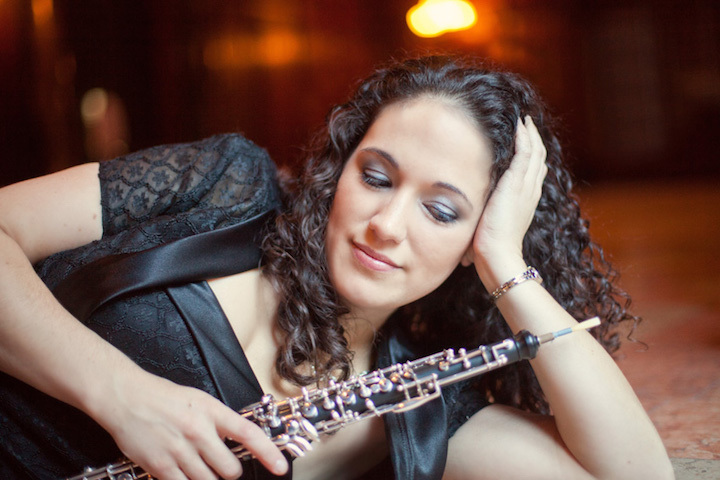 Individual works, as well as composers, bring audiences to concerts—or keep them away. 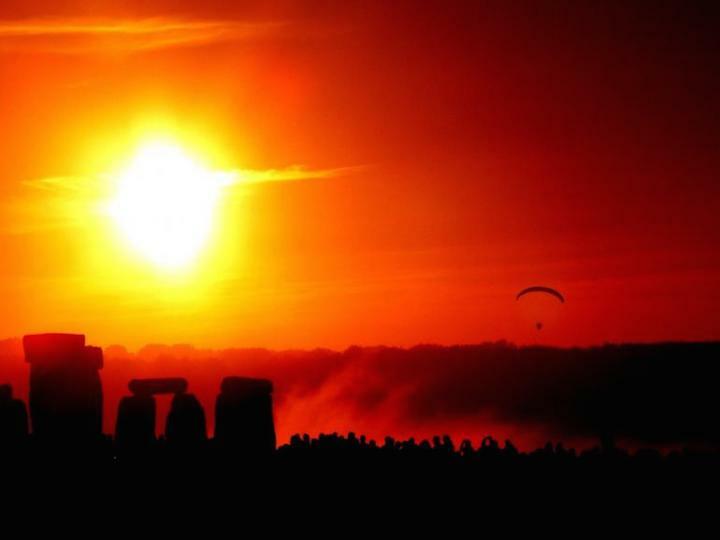 Is The Ear – or The Curmudgeon – alone in thinking this way? Are you also frustrated when performers and presenters leave out specific programs or make them hard to find? Do you, as readers and concertgoers, like to see individual pieces as well as composers listed for an upcoming concert program? Does knowing the individual works to be performed help you decide whether or not to attend a concert? 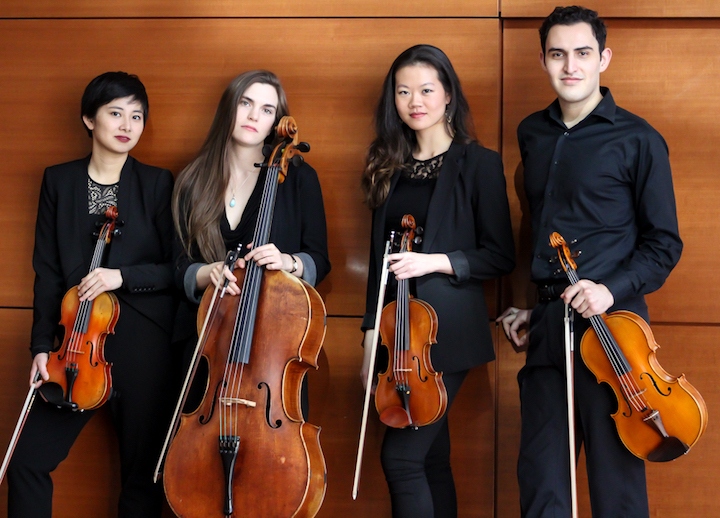 ALERT: The concert on next Wednesday night, Feb. 3, by the University of Wisconsin-Madison‘s Pro Arte Quartet has been CANCELLED due to an injury of one of its players. Here is a special posting, a review written by frequent guest critic and writer for this blog, John W. Barker. Barker (below) is an emeritus professor of Medieval history at the University of Wisconsin-Madison. He also is a well-known classical music critic who writes for Isthmus and the American Record Guide, and who for 12 years hosted an early music show every other Sunday morning on WORT FM 89.9 FM. 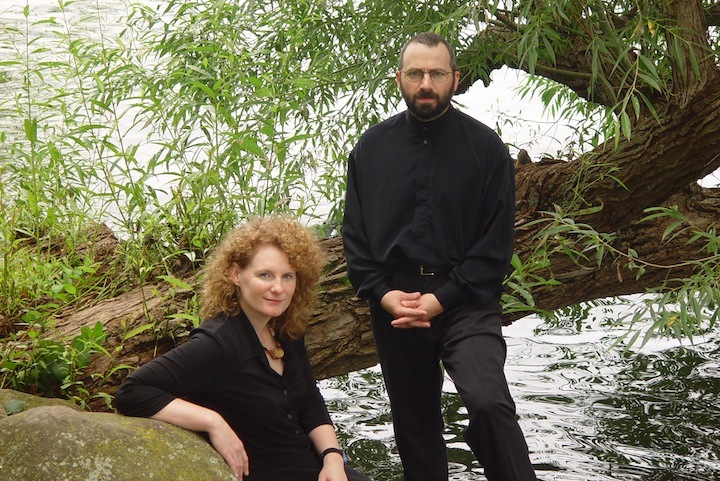 He serves on the Board of Advisors for the Madison Early Music Festival and frequently gives pre-concert lectures in Madison. Barker also took the performance photo. The Willy Street Chamber Players have already awakened us to Madison’s East Side as a promising new locale of our musical life. And in presenting their program in A Place to Be, the old store converted into a conversation haven at 911 Williamson Street, they have given us further reminder of that area’s lively community life and activities. 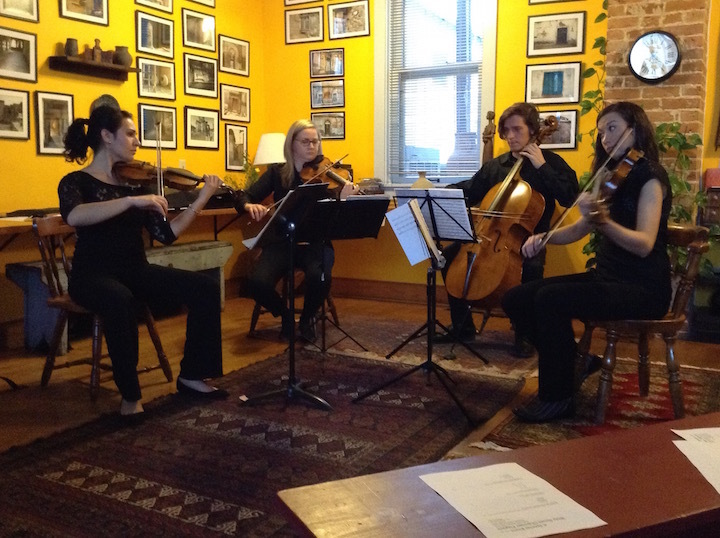 The small space was certainly the kind of intimate venue ideal for music by string quartet: indeed, it made for virtually an in-your-face confrontation. Four members (below) of the Willys’ core ensemble were on hand. Violinists Eleanor Bartsch and Paran Amirinazari (alternating in second and first chairs), violist Beth Larson and cellist Mark Bridges made up a well-balanced string quartet. 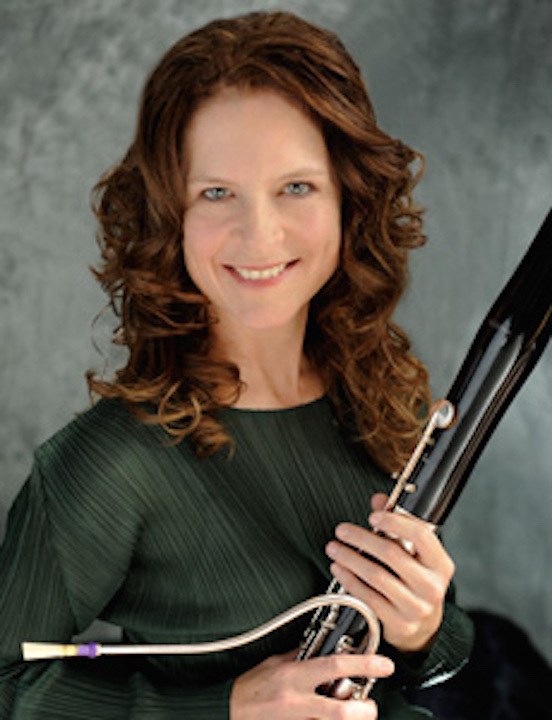 Their program of four works displayed anew the level of enthusiastic music-making these players have set for themselves, but also of their wide-ranging mix of repertoire. The opening piece was Wolfgang Amadeus Mozart’s beloved Serenade, Eine kleine Nachtmusik (A Little Night Music). As first violinist, Bartsch – who won honors at the University of Wisconsin-Madison School of Music — set an exuberant tone for what became a newly fresh masterpiece. The second work, Anton Webern’s early Langsamer Satz (Slow Movement), can sometimes seem too extended for its 9-minute length. But these players imparted a forward-moving pulse to its heavily Late Romantic character that made it a lovely experience. And I must say that Larson made me aware for the first time of just how significant a role the viola part has in holding together the dense texture. 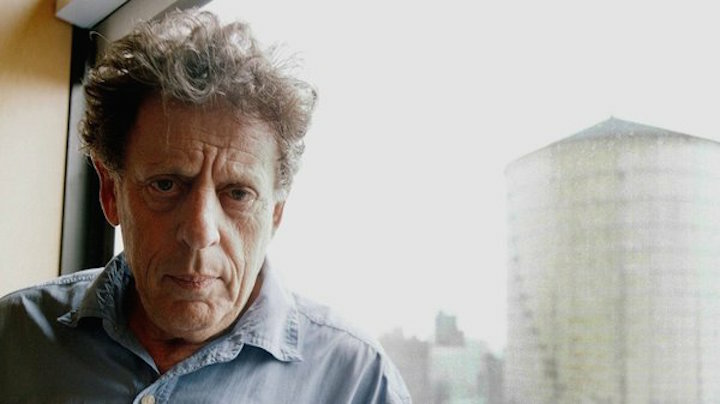 The contemporary American composer Philip Glass (below) is inevitably typecast as the arch-exponent of minimalist repetition. His 9-minute String Quartet No. 2 “Company” certainly reflects such techniques, but its four short movements allow a dispersion of their effects without making them unwelcome. Finally, Dmitri Shostakovich’s 15-minute, four-movement String Quartet No. 1, dating from 1938, revealed a composer enjoying energy and affirmation, with only traces of the deeper, darker, more introverted writing that would come about in his subsequent 13 quartets. Particularly striking was the nostalgic second movement, largely dominated by the viola, the role of which Larson brought off to eloquent perfection. 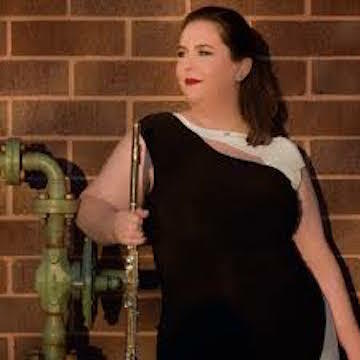 These two concerts served as mid-season reminders of the projected second summer season by the ensemble (below), to come in July. Full announcement of its program details and other news will come in a week or so. But the teasing hints about the repertoire ahead sounded fascinating. I, for one, found my mouth watering at many of them. So you are all on notice, then, that this exciting ensemble, bursting with youthful talent, will once again bring special novelty and artistry to another summer’s musical life.